Will Running too much hurt your body? That is a great question! 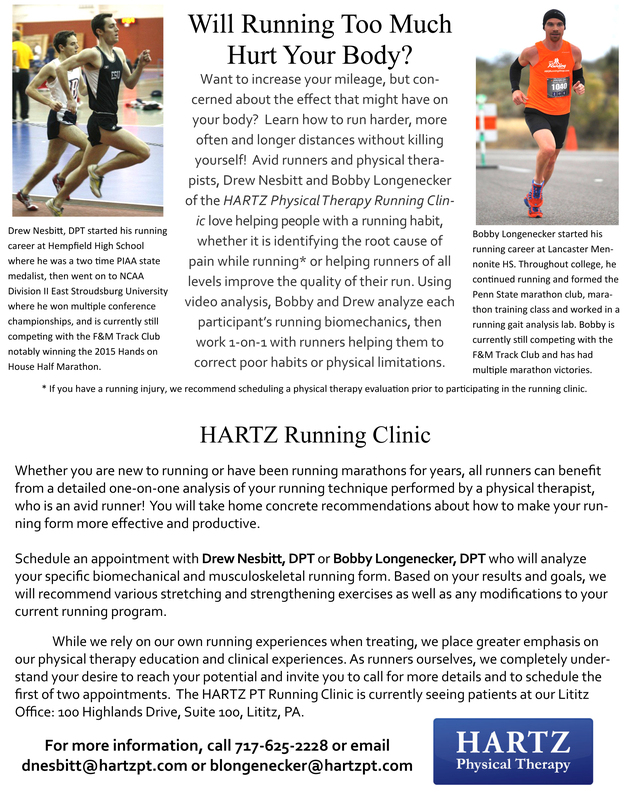 The HARTZ Running Clinic can tell you how to increase the likelihood of the answer being “no”! The Running Clinic was developed to improve your running experience. Are you currently having some pain with running, new to running, or looking to increase your mileage without the inconvenience of common injuries?You can benefit from a detailed one-on-one running analysis performed by a physical therapist who is also an avid runner! Schedule an appointment with Drew Nesbitt, DPT or Bobby Longenecker, DPT who will analyze your specific biomechanical and musculoskeletal running form.